♫ The Waveney Valley Folk Collective present folk trio Granny's Attic at the Eye Bank this Saturday. 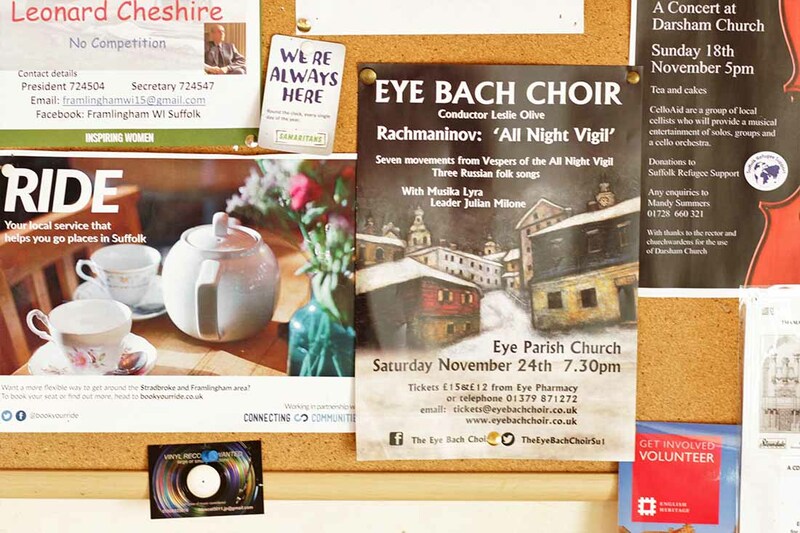 Saturday at Eye Parish Church Rachmaninov's All Night Vigil by the Eye Bach Choir. ♫ Rock and Roll Remembrance dance the Eye Bank tonight. We first saw the Keeper's Daughter's Romeo or Juliet crikey seven years ago at Hartismere School Eye. Like Dr Who it keeps regenerating and yesterday's afternoon show at the Wingfield Barns had a confident young cast who often played with the expectation of what a play should be, we particularly liked the audience joining in with the dancing. No doubt RorJ will regenerate somewhere near you soonish ... on our way home the Stradbroke Spar had shelves that need to be filled. Charles Dickens' A Christmas Carol from the Keeper's Daughter (their production a few years back was terrific fun) at the Eye Bank next week end. Charity box stolen in Eye burglary last Thursday. Quiz at the Eye Bank Saturday night, five pound per head to help the arts centre survive. Very sorry to learn that the excellent Eye Bank has money troubles but volunteer manned will re-open Wednesday and a second community workshop Thursday evening. ♫ Last night Canadian Lynne Hanson and her band hit the spot at the Eye Bank and we were sonically tickled by the melodic bass licks of Mari Joseé Dandeneau. In 2014 we photographed Lynne on crutches at Easton Farm Park and it has taken three operations and until this year for her to be right again ... pleased to hear it. The Eastern Angles spring show Somewhere in England is in Eye tonight. JOBS As of today there seem to be care (mostly night) assistants wanted in Eye, Framlingham, Halesworth, Saxmundham and Woodbridge. On the Framlingham Market Hill today both windy and the Castleton Brass Band (they're from Eye). 2pm today the Castleton Brass Band (they're from Eye) will perform a Christmas concert at Tommy Mills Framlingham, tickets will be available on the door. The Tramps in the the Halesworth Cut last night has moved on since we last saw it in the Eye bank, it now includes a running joke about Ed Sheeran with his lovely red hair and his lovely blue eyes. The Keeper's Daughter's show Beauty's Legacy is travelling way out of East Anglia this spring but kick's off tomorrow at the Bank Eye and returns on the 10th to Stradbroke. At yesterday's meet and greet in Eye Chief Constable Douglas Paxton had handcuffs and a cs spray on his belt, as one attending officer commented He is a policeman. The Chief Constable and Commissioner Tim Passmore will be meeting and greeting through out the summer, the next one is Friday July 25 in Lowestoft. A free concert at the Eye community centre this noon, tonight a Valentine's disco in Saxmundham and free sports for youngsters in Leiston but sadly tonight will also be Chelsea's last (for obvious reasons) dispensing liquid therapy at the Framlingham Station. We nominally visited the Eye Bank Tuesday to see Christine Cooper's weekly print class but was distracted (we're easily distracted) by the building. It had been the Midland bank but earlier this year in blisteringly fast time the pretty much abandoned fabric was renovated to became an arts centre and a cafe with a proper coffee machine. Though a few of the rooms seem to be searching for a purpose considered thought has been used and we were gratified to inspect a real strong room. LibDem Daisy Cooper gave Suffolk Coastal's mp Therese Coffey a run for both their finances at the last general election ... related in a blood relation way Daisy's mum Christine will be leading the first of five weekly print making sessions at the Eye Bank this coming Tuesday.